Thanks to Arthur Aldridge, Larry Sanderson for caption help on this page. Pat Larson in the L.A. in 2006 Bid Party. 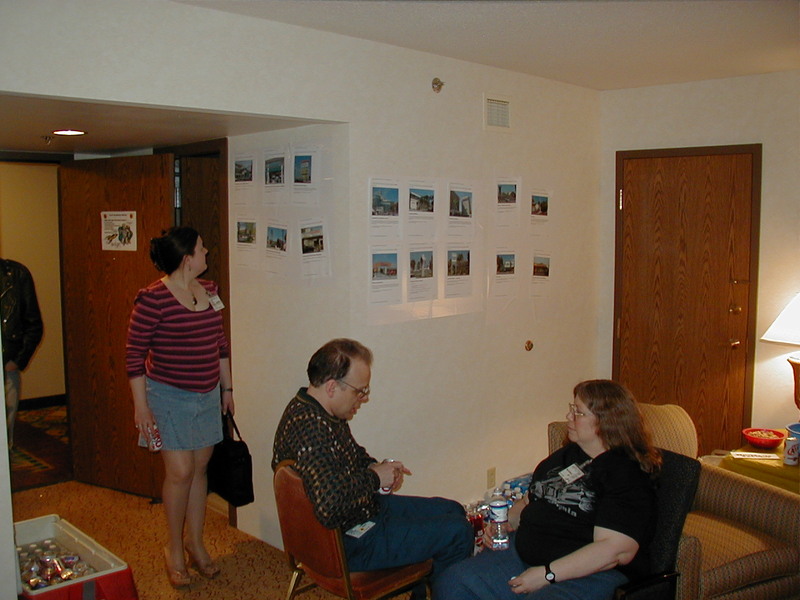 The signs on the wall in the L.A. in 2006 party room consist of photos taken in and around Anaheim. People in the L.A. in 2006 bid party room. Anna Waltz in stripes, Jonathan Adams sitting and talking to Hope Leibowitz far right in black t-shirt. Jonathan Adams sitting and talking to Hope Leibowitz in black t-shirt. The ice chest (Rocket Refueling Station) in the party room.